This wilted lettuce salad has been around in our family for years. This salad was always served with our family favorite, Chicken Noodle Enchiladas Note: You can change the number of people served by placing your cursor over "Servings". The Ingredients will adjust to the new number of servings. Rinse and dry the lettuce, break into pieces and place in a bowl in the refrigerator. Fry the bacon till crisp, drain on paper towels and crumble. Combine the bacon fat with vinegar, sugar, onion, salt and pepper. Pour over the lettuce and toss to blend. 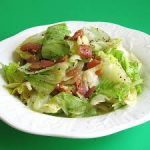 Sprinkle lettuce with crumbled bacon and serve. This sounds great! I’m going to make it tonight!